• Location: River Mile 437.8. • River Elevation: 49 Feet. • Highway: LA-3128 (Closed), US-80 (Former). • Railroad: Kansas City Southern. • Daily Traffic Count: 12 Trains Per Day (Estimated). • Bridge Type: Continuous Steel Truss Through Deck. • Length: 8,546 Feet Overall, 825 Foot Longest Clear Span. • Width: One Railroad Track, 18 Foot Roadway. • Navigation Channel Width: 800 Feet. • Height Above Water: 116 Feet. 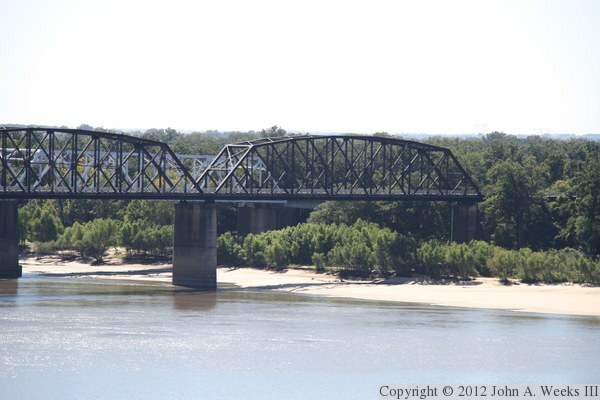 • Date Built: Opened April 28, 1930 (Rail), May 20, 1930 (Road). 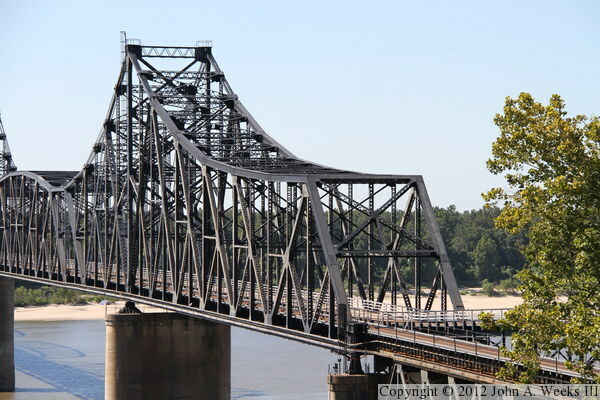 There are several bridges over the Mississippi River that are shared between automobile and railroad traffic. 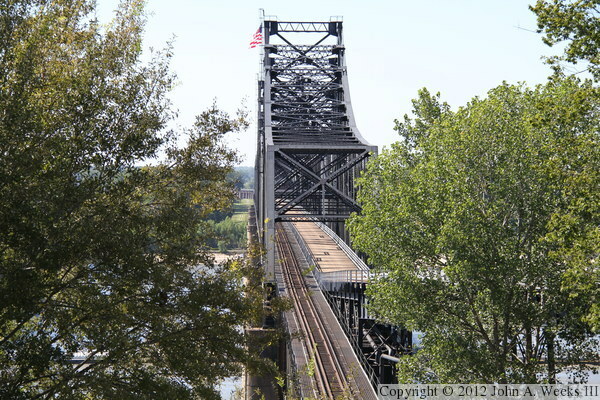 There are double-deck bridges such as the bridges in the Quad Cities, Fort Madison, Keokuk, and Saint Louis. 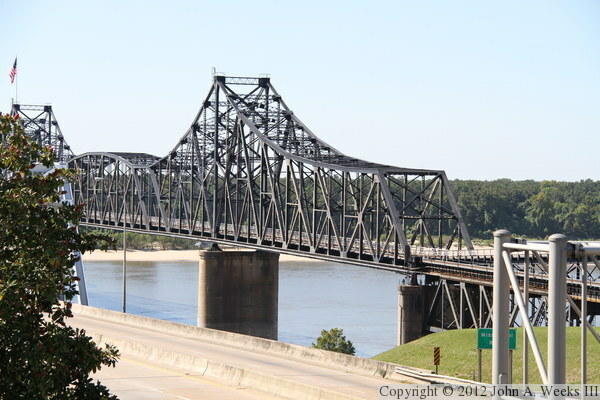 There are also those where the traffic lanes were hung off the side of the bridge, such as the two Huey Long bridges (Baton Rouge and New Orleans) and the Harahan Bridge in Memphis. But in this case, the highway and railroad tracks run side by side through the truss structure. That is unique on the lower Mississippi River. It must have been thrilling to meet both a train and oncoming traffic on those narrow 9 foot wide lanes. Old timers report that trucks would ride their tires on the railing and still smack their mirrors against oncoming trucks from time to time. Automobile drives would often speed across the bridge to avoid being on the structure at the same time as a train. The original east-west highway through this area was the Dixie Overland Highway, one of the original autotrails designated by the US Bureau of Public Road. It was advertised as the shortest and the only year-around ocean-to-ocean highway in the United States. It crossed the Mississippi River at Vicksburg on a ferry. In 1927, the road was renamed US-80 when the American Association of State Highway Officials adopted a standardized national highway numbering plan. 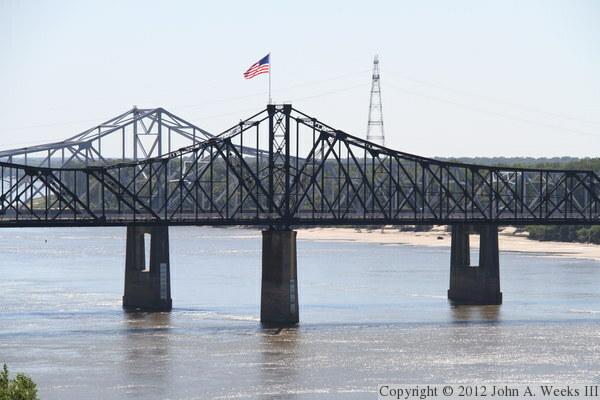 US-80 now crosses the Mississippi River on the newer Interstate highway I-20 bridge 300 feet downstream. The old bridge still carries the Louisiana state highway designation LA-3218. The traffic lanes of the bridge deck was found to be too brittle to support the daily pounding from cars and small trucks. As a result, the bridge was closed to vehicle traffic in 1998. Trains, however, still operate on the bridge. 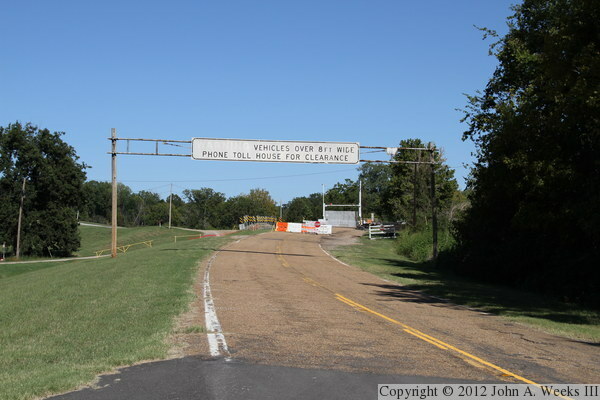 When the bridge closed, the small town of Delta, Louisiana, was left with a 6 mile detour to get to Vicksburg. A riverfront park planning process occurred in the mid-2000s, with local residents on each side of the river expressing overwhelmingly that they wanted to see the bridge reopened. Local spent time evaluating if they should repair the roadway and reopen the bridge, leave it closed, or develop it into a linear park much like the Chain Of Rocks Bridge in Saint Louis. At this time, Warren County commissioners are electing to keep the bridge closed, mostly due to the narrow traffic lanes. 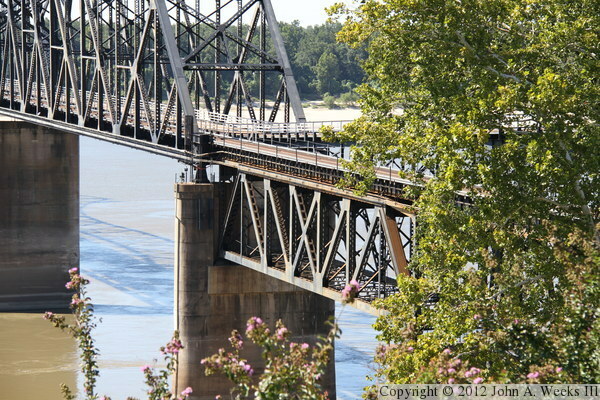 The Old Vicksburg Bridge is still open to pedestrians one day each year. The Southern Cultural Heritage Foundation sponsors an annual ‘Over The River Run’, which includes a five mile run, five mile walk, and a 1 mile fun run for kids. The 23rd annual event was held on Saturday, October 8, 2011. 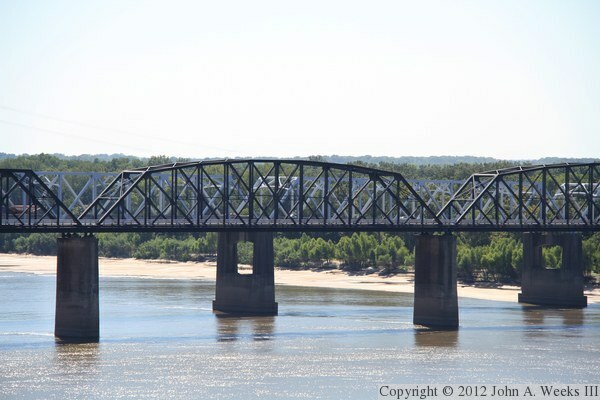 The Vicksburg bridge is situated in the river much like the Humphreys Bridge in Greenville, Mississippi. The structure is located just downstream from a sharp curve where the river recently changed course. 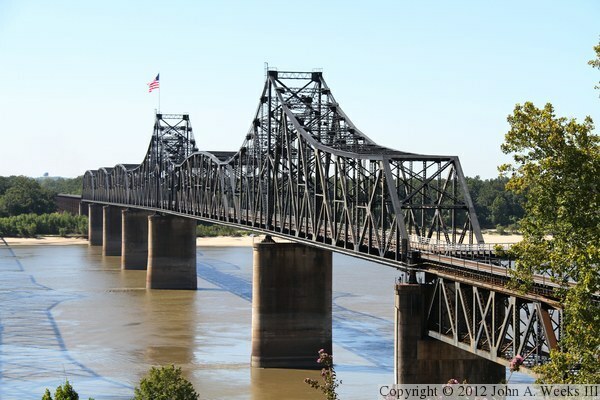 A similar cross-current and the convergence of the Yazoo River combine to make this the most challenging Mississippi River bridge to navigate. As an example, two different barge tows stuck the bridge on the weekend of April 5th and 6th in 2008. The collision on April 5, 2008, resulted in several barges becoming disconnected from the two and drifting downstream. The April 6, 2008 incident saw 19 barges being scattered when the tow struck the main bridge pier on the east side of the navigation channel. As a result, the US Coast Guard restricted barges to running in single file when passing under the bridge during that period when the river levels were high. Another serious barge accident happened on March 23, 2011, as river levels were rising towards major flood levels. The tow vessel, Kay A. Eckstein, collided with a pier on the old bridge. 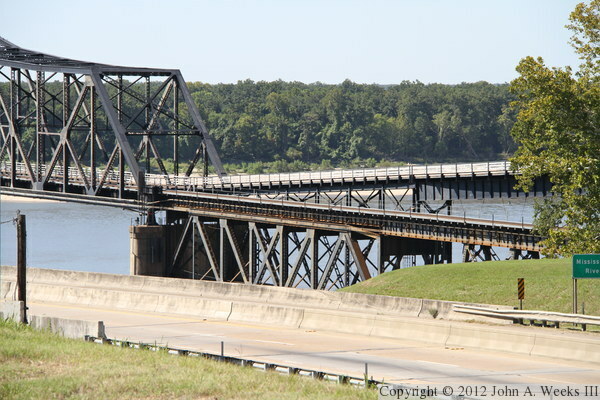 The barges came loose, with on becoming lodges against a pier on the I-20 bridge and sinking. Officials closed one eastbound traffic lane to stage equipment used to monitor the situation. The sunken barge was partially blocking the navigation channel, forcing river traffic to be restricted. It took several weeks to formulate and execute a plan to salvage the barge and inspect the bridge. 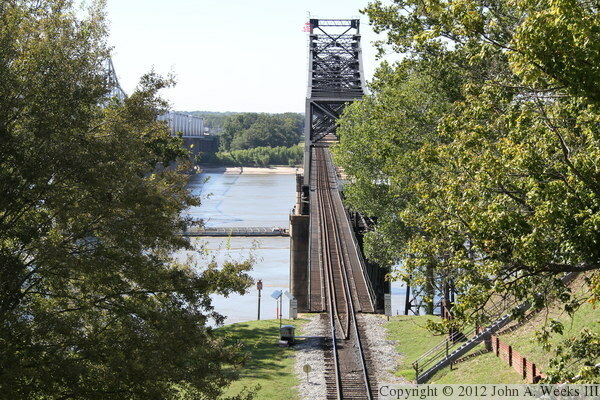 The Mississippi River has an interesting history near Vicksburg. The city was the last major fortress to holdout on the great river for the Confederate States of America during the Civil War. The city commanded a high view over the river preventing the Union Army from moving past Vicksburg, and the vast swamps in the area prevented the Union Army from flanking the city. General Grant attempted to cut a new diversion canal to reroute the Mississippi River away from the city so it could be bypassed. This effort failed, but the Union eventually prevailed when it took on those swamps. Later, the river picked a new channel during a flood, leaving Vicksburg high and dry. Only the very southernmost part of town still faced the river. It was desired to restore water to the city waterfront, but moving the Mississippi River back to its old channel was beyond the technology of the day. An idea was formulated to divert the Yazoo river, which flowed into the Mississippi upstream of Vicksburg, dumping its water into the old river channel upstream of Vicksburg. 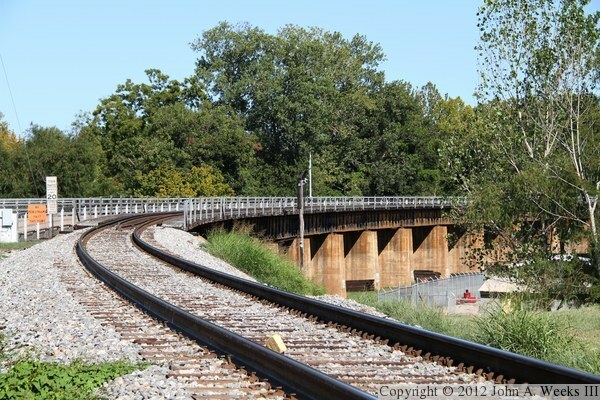 This rerouted the Yazoo River past Vicksburg, restoring the waterfront to the historic city. 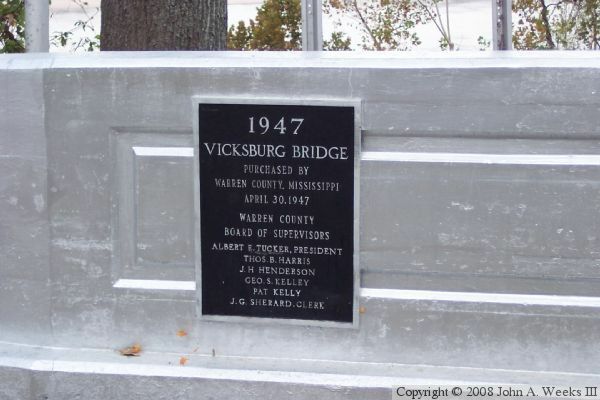 A serious accident occurred when the Old Vicksburg Bridge was being built. The mid-river pier foundations were built by sinking large metal caissons. Air would be pumped into the caissons to keep them from flooding. That would allow workers to dig at the riverbed to excavate down to bedrock. One of these caissons collapsed, resulting in the deaths of 48 workers. The bridge has also seen several issues since it opened. Shortly after it was built, an underwater landslide caused the first two piers on the east side of the river crossing to shift in position. As a result, the metal truss structure leans just slightly on the Mississippi end of the structure. More recently, a fault was discovered under the east riverbank, causing the bridges to slowly drift slightly out of alignment. While researchers were investigating the fault line, they discovered that a retaining wall is failing under the east bridge abutment, which could lead to the face of the bluff collapsing. A project is underway in 2010 and 2011 to stabilize the bluff in front of both bridges. 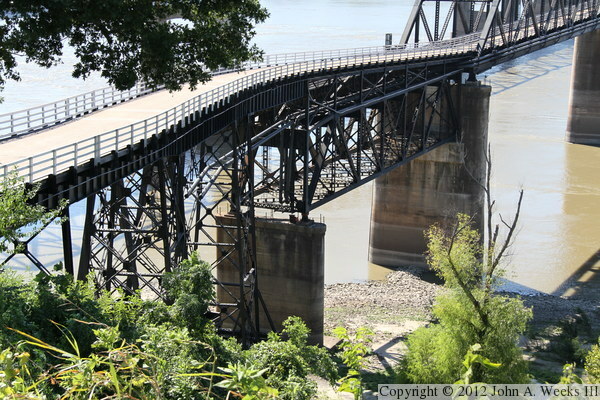 The photo above is looking west along the downstream south face of the Old Vicksburg Bridge. 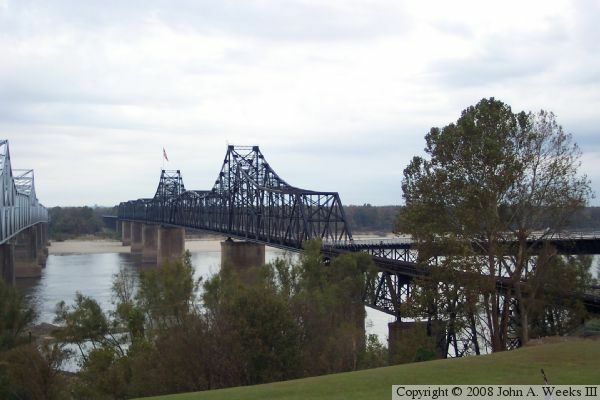 The vantage point is the Mississippi Welcome Center, which is located between the old and new bridges on the east side of the river as you enter Vicksburg. Note that the shadow of the new bridge is visible on the surface of the Mississippi River on the left side of the photo. 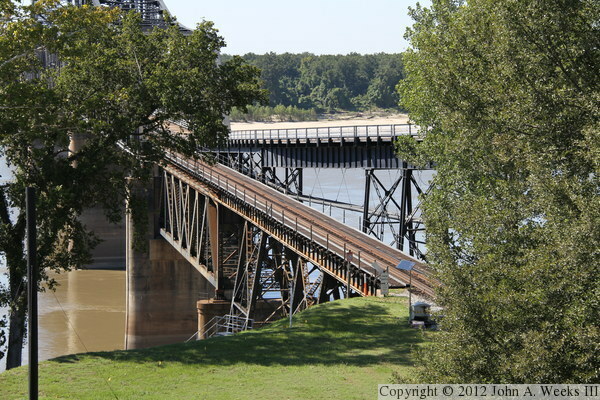 The photo above is a view looking west along the upstream north face of the Old Vicksburg Bridge. The vantage point is Navy Circle, a large mound that was built during the Civil War as a gun emplacement. The far shore is Louisiana, with the small town of Delta being located at the west end of the bridge. 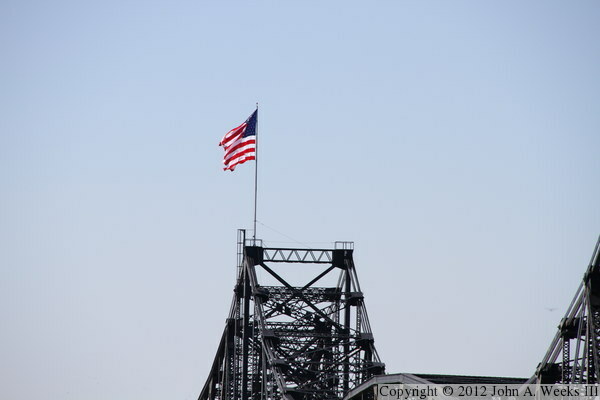 The photo below is a close view of the flag that flies proudly over the center of the bridge. The photo above is a closer view of the downstream face of the eastern section of the four span continuous truss superstructure. The photo below is a closer view of the deck truss span as it connects to the main bridge truss superstructure. The vantage point for these two photos is the Mississippi Welcome Center. These two photos are essentially the same photos but from a slightly further downstream vantage point located on the south end of the US-61 overpass over Interstate highway I-20. The photo above is the eastern section of the continuous truss superstructure while the photo below shows the deck truss approach span. The level section supports the KSC railroad track while the ramp is the approach for vehicles. These two photos are views looking downstream from Louisiana Circle, an small overlook along highway US-61. 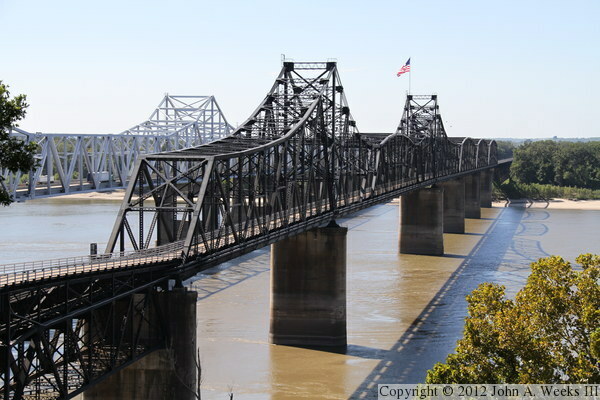 The photo above is the western end of the 4 span continuous truss section of the Old Vicksburg Bridge. The photo below is a wider view showing the main navigation span of the bridge. The building on the left is the Ameristar Casino hotel. 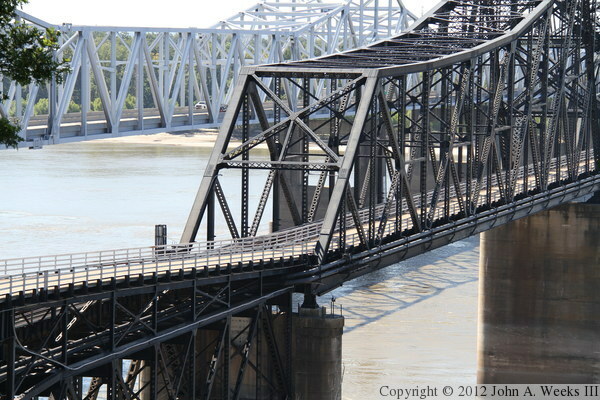 These two photos are views of the single span bridge trusses on the west side of the Mississippi River crossing, also seen from the Louisiana Circle overlook. The photo above is the eastern of the three single span trusses, while the photo below is the western of the three single span trusses. These photos were looking directly into the afternoon sun, resulting in poor contrast. This photo is looking west down the length of the Kansas City Southern railroad tracks. The vantage point is the parking lot of the Mississippi Welcome Center. The railroad track passes under the welcome center and part of the US-61/I-20 interchange in a series of two tunnels. The entrance to the tunnel is directly below where I was standing. The tree on the right blocks the view of the highway lanes, so I moved just slightly to the south for the photo below. This shows the roadway and rail line running side by side through the truss structure, and shows how narrow the roadway is. 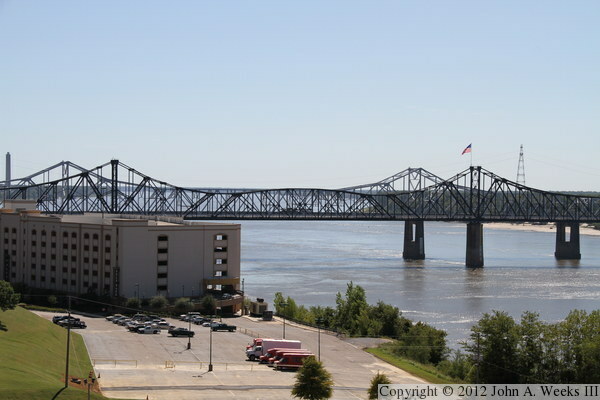 The photo above is looking northwest form the Mississippi Welcome Center observation deck. This gives us a view of the steel trestle and deck truss approach span carrying the KSC rail line. We also see the ramp carrying the traffic lanes down to the main bridge truss spans. The photo below is a view of the connection between the highway trestle and the main bridge superstructure. This view is from Navy Circle, a Civil War era gun emplacement. The photo above is another view from Navy Circle, showing the upstream side of the traffic lane approach spans. The span closest to the main bridge structure is a deck truss span. This deck truss supports both the rail line and traffic lanes. Interestingly, the rail line is level, but the traffic lanes have a slope down towards the main bridge structure. A trestle connects between the bluffs and the deck truss span. This trestle is a series of deck plate girder spans supported by steel towers. The photo below is a view of the traffic lanes leading down to the main bridge structure from the east bridge abutment. This shows that the trestle spans from an S-curve in order to line up with the deck truss span. 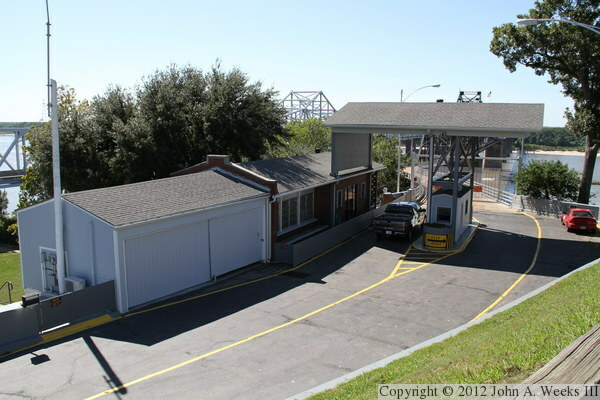 These two photos are views of the toll booth and bridge operations office. The vantage point is a pedestrian bridge leading from the Mississippi Welcome Center north to Navy Circle. 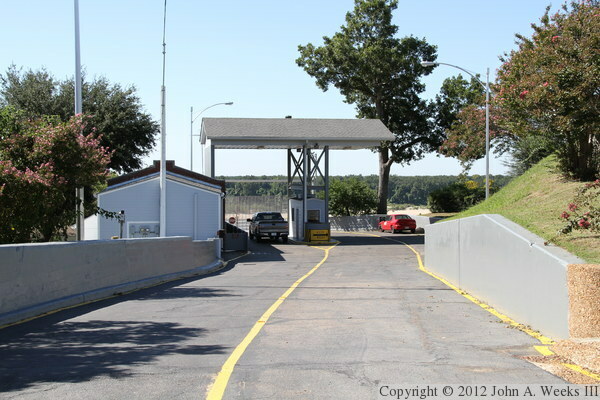 The photo above is looking west towards the toll booth from street level. The photo below is the bridge plate that was installed after Warren County purchased the bridge in 1947. 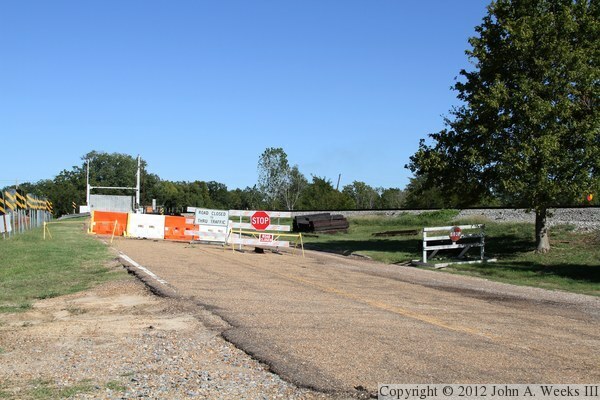 This photo is looking eastbound along Louisiana state highway LA-3128 in the small town of Delta towards the west bridge abutment. This was formerly highway US-80 before the new bridge was built. The photo below is a closer view showing the signs were the road leading to the bridge is closed. The KSC railroad line is located on the right side of the photo. The photo above is the gate where the traffic lanes are blocked off. The photo below is the north face of the west bridge abutment. The gate is located directly above the abutment. 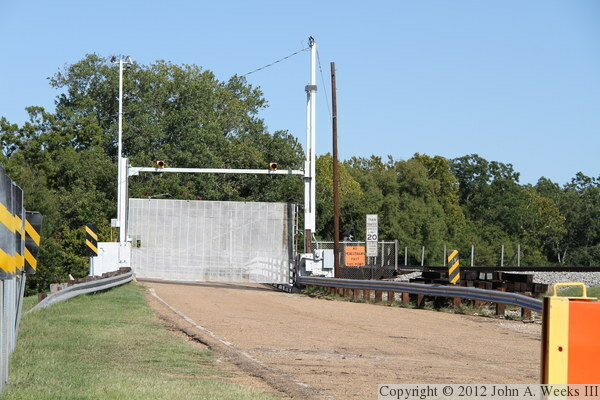 There are signs, fences, and cameras to discourage anyone from attempting to enter the bridge. 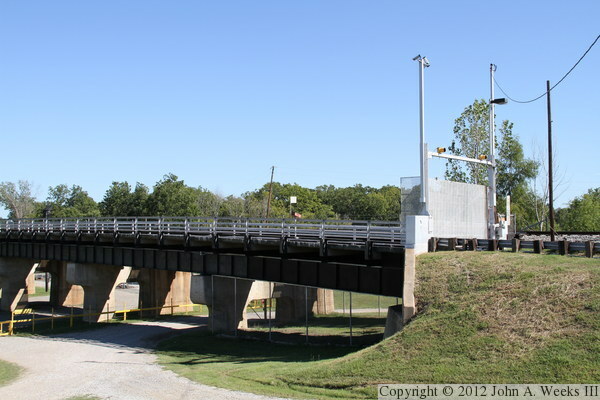 The road under the bridge provides access to a bridge maintenance yard and the levee. 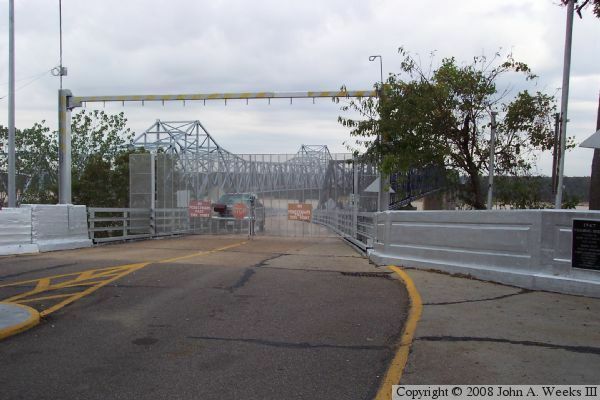 A road runs along the south side of the approach spans to provide access to a large sandbar on the west shore of the Mississippi River, but that road is now closed to the public due to an unfortunately large number of drownings in the tricky water near the bridges. The photo above is the KSC railroad tracks as the curve towards the west bridge abutment. The bridge consists of almost a mile of approach spans between the west bridge abutment and the through truss spans over the Mississippi River. The first 1,000 feet of approach spans are steel deck plate girder spans supported by shorter concrete piers placed approximately 50 feet apart. The remaining 4,000 feet of approach spans are supported by piers that are set in groups of two spaced about 30 feet apart, with 60 feet between each group of two. Each pair of two piers consist of two short concrete piers that support a steel tower, with the tower holding up deck plate girder spans. The remaining photos below are older views from 2005. 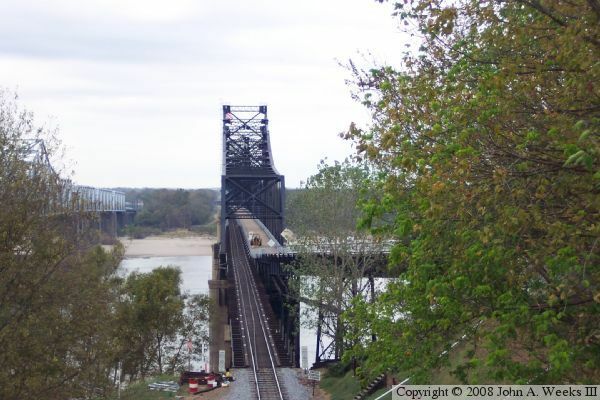 The photo below is a view looking west towards the south face of the Old Vicksburg Bridge from the riverbank on the Mississippi side of the river. 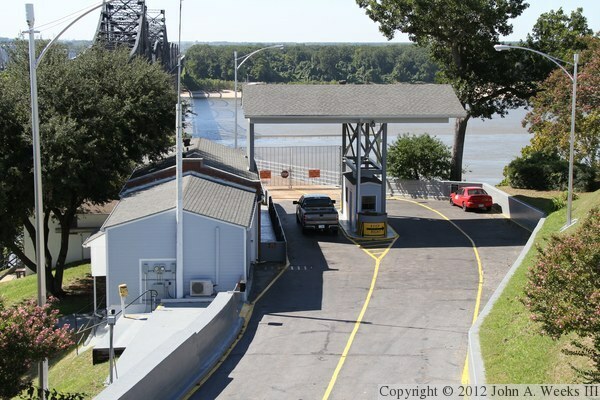 The photo above is a view looking directly west at the bridge portal on the Mississippi side of the river. While the railroad track remains straight and level when exiting the bridge, the highway deck veers off to the north and climbs a modest grade to reach the top of the river bluffs. 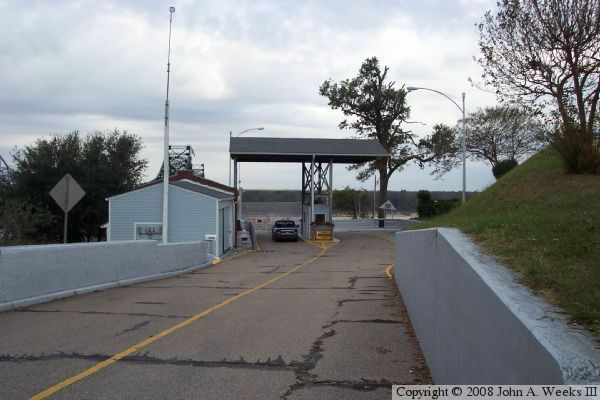 The photo below is a view looking west down the automobile deck entrance road from the east side of the river crossing. 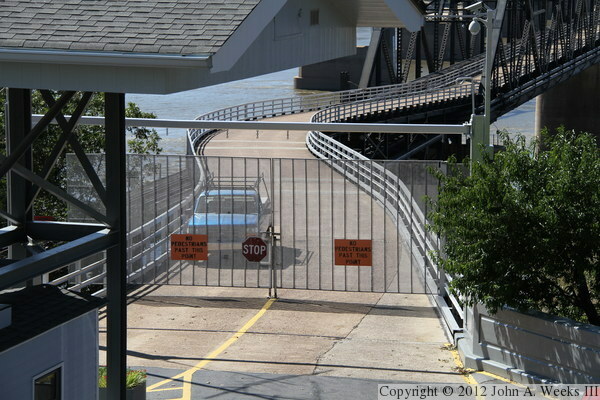 The entrance was blocked with a chain link fence at the time of this visit late 2005. 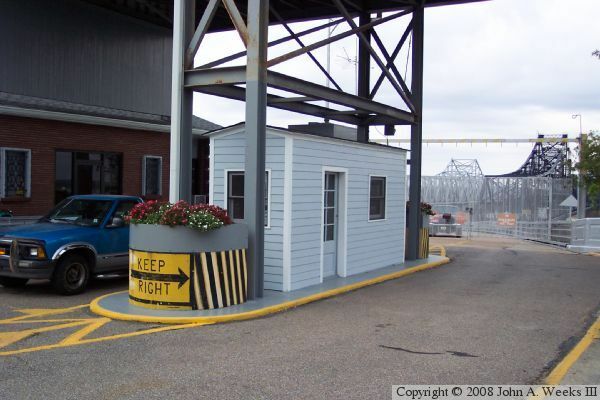 These two photos are views of the toll booth on the Mississippi side of the river. The photo above is the tool booth as seen from the approach road. The photo below is a close view of the structure. Both views are looking west towards the river crossing.